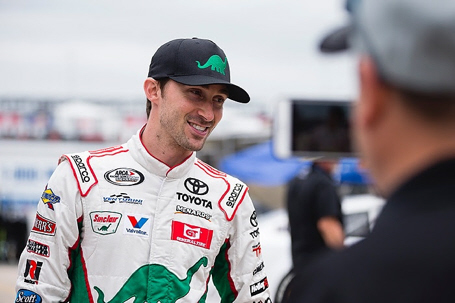 Concord, North Carolina (April 10, 2019) – Coming off his first series’ short track victory of his career last month in Pensacola, Michael Self (No. 25 Sinclair Oil Toyota) is set to return to the track this weekend when the ARCA Menards Series resumes action at Salem Speedway on Sunday, April 14. Self, 28, a four-time ARCA Series tour winner, is in the midst of competing in his first full season effort. Currently occupying the fifth spot in the championship standings, Self’s upcoming Salem start marks just his second career visit to the famed Southern Indiana short track. During his first career attempt at Salem last season, Self qualified third and ran up front most of the night but finished a disappointing 16th after a controversial run in with series’ driver Zane Smith ended his day prematurely during the late stages of the fall classic. Since making his ARCA Menards Series debut with VMS in 2014, Self, a native of Salt Lake City, Utah, has accumulated 4 wins, 12 top-5 and 12 top-10 finishes in 21 series starts. Self’s VMS Toyota team returns winners of four of the last six series events on Salem’s half-mile track. Overall the longtime ARCA team has collected eight of its 54 series wins at Salem. Practice for the Kentuckiana Ford Dealers ARCA 200 is set for 11 am ET on Saturday, April 13 with General Tire Pole Qualifying scheduled for 3 pm ET that afternoon. The green flag on round three of the 2019 ARCA Menards Series season will drop shortly after 2 pm ET on Sunday, April 14. The race will be televised live on MAVTV and live timing & scoring will be available at ARCARacing.com.